Whenever we are with our indigenous congregations, there are always surprises. Sunday, May 31, was no different. We were supposed to meet the Pisimbilla congregation for a baptism. We were to meet at a gas station in the town of Cayambe at 9:30 AM. We left Quito early to ensure we had enough time. We arrived early and waited…and waited…and waited. Everyone finally arrived at 11 AM. Thus my OCD was beginning to surface! We next drove to a part of Cayambe known for warm volcanic springs. 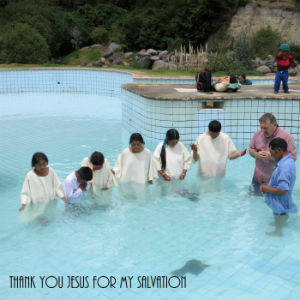 Cayambe can be very cool, and warm water seemed a good idea to me since I was doing the baptizing. 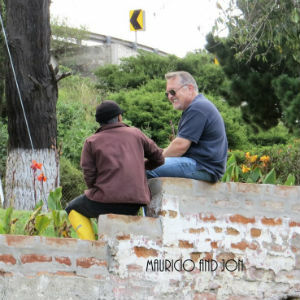 As we drove to the springs, Pastor Carlos informed us that he had not been to these springs in thirty-five years. That’s right, we were going to a popular tourist area on a busy holiday weekend with no idea where we would actually have the service. So, the first location was closed and had been for twenty years! The second location would not let us use the pools because they were full of tourists. The third location was also full. By then I began to laugh to myself. “Yep, another service unplanned and unprepared.” Thoughts began racing through my mind of how the church in Ecuador would never advance until our people learned to think ahead! Then Pastor Carlos disappeared. I looked at my watch and it was now after 1 PM. Finally, Carlos returned to announce that we were walking once again to another spring across and down the road. We walked over and down into a series of pools run by the city of Cayambe. There we met Mauricio, the caretaker. Mauricio led us to a nice small tiled pool being filled with warm spring water. We had a wonderful baptism service and all went well. Mauricio then told me how he arrived on Sunday morning only to find a different valve had been left open and the pool had not filled with water. So Mauricio quickly shut the open valve to fill the newly cleaned pool. Next Mauricio said, “I was sitting up by the entrance directing people to the lower pool waiting for the clean pool to fill. Several asked to use the filling pool. “No,” he said, “that pool is reserved for special people who are arriving later. Then,” he continued, “your Brother Carlos came down the road. He told me that he had a group who was looking for a place to baptize.” Then, with a big smile, Mauricio said, “I told Brother Carlos that I had his pool ready.” By the time we began the service the level of the pool was waist high, just a perfect height for baptizing. Just our group, in a pool just for us, warm clean water prepared just for us, at no cost. The day could not have been planned any better. I continue to realize that as we plan and plan, trying to get everything right, we plan God right out of our lives. Brother Carlos never finished grade school—he went to work as a child. Carlos does not know the latest trends in Christian leadership. Brother Carlos knows only to trust God, and follow. Had I been preparing the baptism service, I would have missed a miracle. I would have missed Mauricio. No, Pastor Carlos did not plan well for that baptism service—Jesus did. Jon and Karen Lambert are serve as Church of God missionaries for Global Strategy to Ecuador. Learn more about Global Strategy at www.chogglobal.org. This entry was posted in All Church of God, Global Strategy and tagged baptism, Ecuador, Global Strategy, Lambert, missionary, missions. Bookmark the permalink.